After studying Psychology at A-Level, Alexandra Minnis developed an interest in the criminal mind, which led her to her choice of degree. “I knew I wanted to work in the criminal justice system somehow and thought Criminology would not only be an appropriate degree for career opportunities but also a really fascinating course to study for three years,” she says. 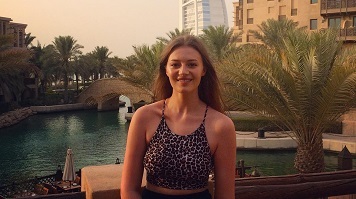 Living and working in London during her gap year after A-levels meant that Alexandra was well acquainted with the capital and so LSBU appeared on her radar. “I always wanted to experience living on my own in the capital city and thought it was best to do this whilst I am a student with fewer responsibilities. I love going on walks in the daytime (always avoiding rush hour) and late at night, looking at the amazing buildings and landmarks in the city. I also am a fan of Krispy Kreme doughnuts and love the fact that there are plenty more stalls here in London than there are in Liverpool! “LSBU’s Criminology course was far more interesting than what was offered at other universities and, of course, the location is amazing. For Criminology students particularly, with the Inner London Crown Court being around the corner, LSBU’s campus is the perfect spot. As a result of all this, the decision to choose LSBU became quite an easy one. Since being here I’ve found that LSBU definitely has a strong focus on employability and I hope that the services provided will help me achieve my goal of potentially working in the city, alongside having completed a very good degree. Alexandra currently helps to run the Criminology Society along with two fellow students. “We work incredibly hard together to organise an event every week that appeals to Criminology students’ interests. This includes employability events where we organise external speakers to attend and give their advice about different careers and Jack the Ripper walks. There is also an upcoming event involving four ex-offenders speaking about how a criminal record is a life sentence. I really enjoy being a part of the Society, as the fun activities complement what we learn in lectures.